Dental Implant History - Who Invented Implants? For Starting It All. . . Professor Per-Ingvar Branemark . . at the very start of dental implant history . . . And His Remarkable Flash Of Inspiration! Modern dental implant history starts in 1957.
Who on earth was the first to come up with the idea of using an ARTIFICIAL tooth root to replace a missing natural tooth? The idea of replacing a missing tooth with someone else's NATURAL tooth goes back to ancient egyptian times. But it didn't work very well! In fact, transplanting a tooth from one person to another has never really worked, even nowadays with all the advances in transplant medicine. But we DO know who had the bright idea for an artificial titanium dental implant! It was an orthopedic surgeon (NOT A DENTIST!) 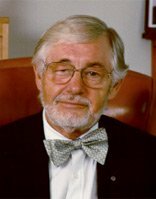 in Sweden, Professor Per-Ingvar Branemark. And the year was 1957. Dental implant history starts here. Branemark was doing research into bone healing. A major problem in orthopedic surgery is getting bones to heal, (after surgery for road traffic accidents and similar problems) especially where there are metal screws and plates holding the bones in place after a car smash (for example). The human body does not like foreign materials, and tries to "reject" them by refusing to heal right next to the material. Like a splinter in your finger. The human body tries to "reject" the foreign material. Normally, bu creating a capsule of collagen cells around the foreign material. As part of Professor Branemark's research, he had fitted small pieces of titanium into the leg bones of rabbits. At the end of the research period, he wanted to remove these titanium pieces, to examine them. To his astonishment, he found that it was impossible. THE BONE HAD BECOME FUSED TO THE TITANIUM. Or, more accurately, the bone had grown around the titanium, and the bone cells had actually grown into the microscopic pits and fissures of the titanium surface. This had never been seen before, and at first Branemark thought his experiment had been ruined! But in a flash of inspiration, he realized that this might be a way of anchoring artificial tooth roots, to replace missing teeth. THIS WAS A REMARKABLE MENTAL LEAP - he was not a dentist, remember! It was a similar flash of inspiration that launched the first antibiotic - penicillin - by Alexander Fleming. Branemark came up with the phrase "osseo-integration" to describe what he had seen. You might hear your dentist talk about an implant "integrating". He means "becoming fused to the bone". But then Branemark had problems getting other surgeons and dentists to accept his ideas! They didn't believe him, and thought he was crazy and just trying to attract attention. Dental implant history almost stalled! The situation was so bad that when he went to dental conferences to talk about his findings, other dentists and surgeons openly laughed at him and ridiculed him! It sounds incredible, now that dental implants are widely accepted as "normal" dental treatment. But Professor Branemark did NOT have an easy time of it, and we have to thank his self-belief and persistence for the opportunities we have today to replace missing teeth. In 1965, he carried out the first-ever titanium dental implant operation, on a swedish patient with jaw deformities. It was a success. But he still had an uphill struggle to persuade the dental world that titanium dental implants could be a reliable way of replacing teeth without dentures! Time moved on, his reputation grew, and business investors became interested in this new technology. Branemark eventually became involved in the commercial manufacture of dental implants, under his own name. The Branemark dental implant was the gold standard of implant design. Some years later, the company was bought by the swedish business Nobel Pharma, and then the headquarters moved to Switzerland. Interestingly, Nobel Pharma still called it the Branemark implant. They knew it had the best reputation in the world. The "Branemark" brand of implant was re-designed a few times, and was available to dentists in several versions. A few years ago, a middle-aged patient came to see me for the first time. He had been attacked in a car park at night, and had his wallet stolen. In the scuffle, (he was a former member of the british Special Air Service, and tried to defend himself) he was hit in the mouth with an iron bar. Ouch! Here's the interesting bit. Years ago, he had had two Branemark implants fitted to replace two front teeth that were lost in military service. In the car park attack, the crowns that had been on the implants were smashed, and one of the metal alloy "anchors" that fits into the implants was bent. BUT the implants themselves were completely firm and solid! I could hardly believe it! I made him some temporary crowns and we waited a month for everything to heal up. Then we checked the implants again. Still rock-solid. It reminded me of Arnold Schwarzenegger's "Terminator" character, where his titanium skeleton survives just about everything while the "human bits" get more and more damaged as the film progresses! When Professor Branemark started dental implant history, he didn't just invent a new technology. He had an excellent product right from the start. This was high quality engineering that has stood the test of time. Remember that patient who got the first Branemark implant in 1965? She died a while ago from old age, but her dental implants were still perfect right up to the end. That's over 40 years! Dental implants made of pure titanium are now manufactured by many companies all around the world. Dental implant history shows that Professor Branemark made the critical initial discovery, and then developed the idea. He created a whole new branch of medicine! You can read about other dental implant manufacturers on this page.